Kolkataproperties.in offers to you a beautiful 1285 sq ft 3 bhk with 1 balcony also an additional 100 sq ft for an extra balcony built later outside sanctioned plan,2 toilets for sale in prince Anwar Shah Road. 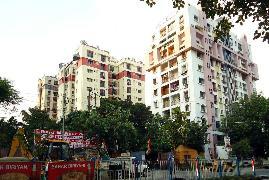 The property is a part of Merlin Residency. It is located on the 2nd floor of G+13 building. This well-Designed semi furnished property with wall wardrobe is ready to move in. The apartment has quality features such as lift(S), swimming pool, visitor parking, water storage, park, security/fire alarm and intercom facility. Garage can be arranged on rent which has an arrangement with Princeton Club.